The ice storm was deemed the largest in Toronto history, but since it follows only fifteen years after a similar ice storm in Quebec and Eastern Ontario these may not be isolated 100-year events. Extreme weather events appear to be on the increase, and 2013 was a banner year. Debates over the Toronto’s preparedness and resilience are ongoing. Anthony Haines, CEO of Toronto Hydro, promised there will be discussions regarding future improvements and “there is no doubt, learning is to be had.” Winter storms can be especially risky when cold weather and power outages overlap, and historically, extreme cold has been far more lethal than floods and heat waves. I suggest that the kind of learning “to be had” includes a broad understanding of our historical relationships with extreme weather and urban energy supplies, including food and heat. Climatologists will be working to identify the frequency of these weather events, but historical climate data also allow historians to create detailed risk-maps of extreme cold weather events in Canada over time. Historical research in energy, transportation, and urban planning may then show us how Canadians adapted to these challenges over time. By the drink from the bottle they had drained to the dregs. Broken windows; no firewood; not even a bed. The frost should have numbered these babes with the dead? Railway companies jumped on other opportunities. The Grand Trunk Railway responded to the Montreal “Wood Famine” by calling foul on the city’s fuel suppliers. For decades these regulated merchants imported fuel on the St. Lawrence River, and naturally raised prices as the supplies dwindled. An early freeze in the winter of 1872, meant that the price of fuel in January was about $12 per cord, or about twice what it cost in July. 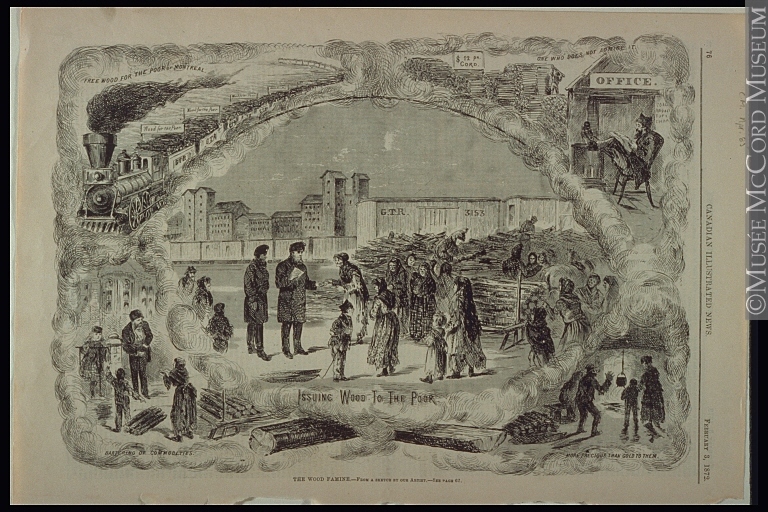 The Illustrated News felt this was unfair-market value, and another image shows the city’s poor freezing to death while icy-fuel suppliers charged exorbitant amounts for firewood. As with many problems of this era, railways came to the rescue, circumventing the seasonality of river-based fuel supply, and it helped to have a disaster like the “Wood Famine” to promote new lines to wood markets. I am exploring these urban energy chains in my research, and in a recent chapter on wood energy in Canada, I have found a significant discrepancy in the data historians have used to explain energy consumption in Canada. I offer new estimates for biomass energy consumption, and I argue that Canadians remained predominantly hewers of wood (or at least burners of wood) long after the supposed “transition to fossil fuels.” One excerpt and image from that chapter seems pertinent in the aftermath of the ice storm. It shows that even in Ontario’s small mill-towns (which historians claim were among the first to abandon wood energy), a variety of fuel supplies existed cheek-by-jowl. Part of the urban and small-town fuel footprint is visible in late nineteenth century Fire Insurance Plans. Piles of cordwood ranging in height from 6 to 12 feet were common sights in many mill yards. Certain industries were attracted to cordwood over coal, especially if cleanliness was important to the mill product. 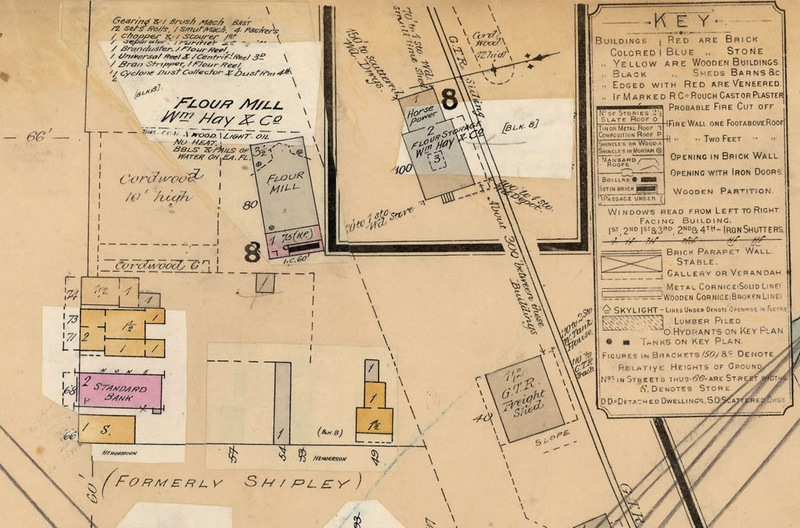 The William Hay & Company flour mill in Ailsa Craig, Middlesex County, contained three woodpiles, and the largest held over 400 cords, possibly for multiple businesses. The Crediton Flour Mill, owned by H. Switzer, was also flanked by three piles of cordwood, ranging from 4’ to 8’ high. Blacksmiths and foundries needed a wider variety of fuels, and H. C. Baird’s Eagle Foundry in Parkhill had a large cordwood pile, a small 1-storey coal shed, and a 1-storey “Coke & Sand” building. Large wood and metal fabrication companies like the Ontario Car Company in London powered their kilns, smithies, and machine shops with “wood & shavings” stored in a massive cordwood pile located beside the company’s rail siding in the 1880s. Even in urban and small-town industry, the Canadian energy landscape was very much mixed. Canadian homes and businesses burned large quantities of firewood that went unrecorded, and they relied on the biomass equivalent of modern utility companies. Bringing energy to urban areas has always required elaborate supply chains. Everyone needed a relationship with a supplier, billing and payment systems, transportation grids and storage depots, burning technologies and people to service them. Almost every town had “coal & wood” dealers, and in the 1870s, as Canada began its second wave of railway expansion, some lines were built, and partly subsidized, for the purpose of bringing rural firewood to urban markets. Torontonians had a small taste of everyday life in the past this Christmas. Today we are used to controlling our energy with a switch, and never having to worry about leaving it unattended, but this is a fairly recent development in cold climates. Solid burning stoves and furnaces were the primary heating source for the majority of Canadians until the post-war period. Most of these technologies worked without electricity. Before oil and natural gas heat sources were more widely adopted and supplied by a grid, furnaces required constant supervision, and all homes with running water had to be closely monitored in the winter months. The power outages remind us of the major problems that occur when our relatively fragile urban energy supply systems are interrupted. In the middle of a heatwave, the loss of power can lead to spoilage, dehydration, and in extreme cases, death. 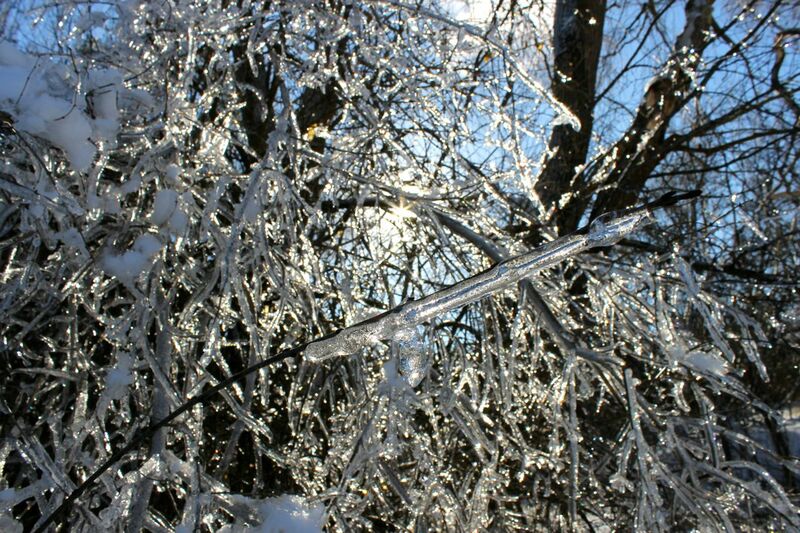 In an ice storm, Canadians endure property damage from fallen trees and frozen pipes, but they also face more extreme risks such as food shortages, car accidents, and exposure sometimes leading to hypothermia and death. Others try to stay warm with barbeques, generators and even coal, and instead put themselves at risk of house fires and carbon monoxide poisoning. Most public institutions and many larger businesses have generators, but demand soon outstrips supply. Restaurants but can only serve so many people when their suppliers are without power or unable to transport goods. Twice as many people die from these cold conditions than from extreme heat in the United States. The ratio is much higher in the northern states and in climates like Canada’s. 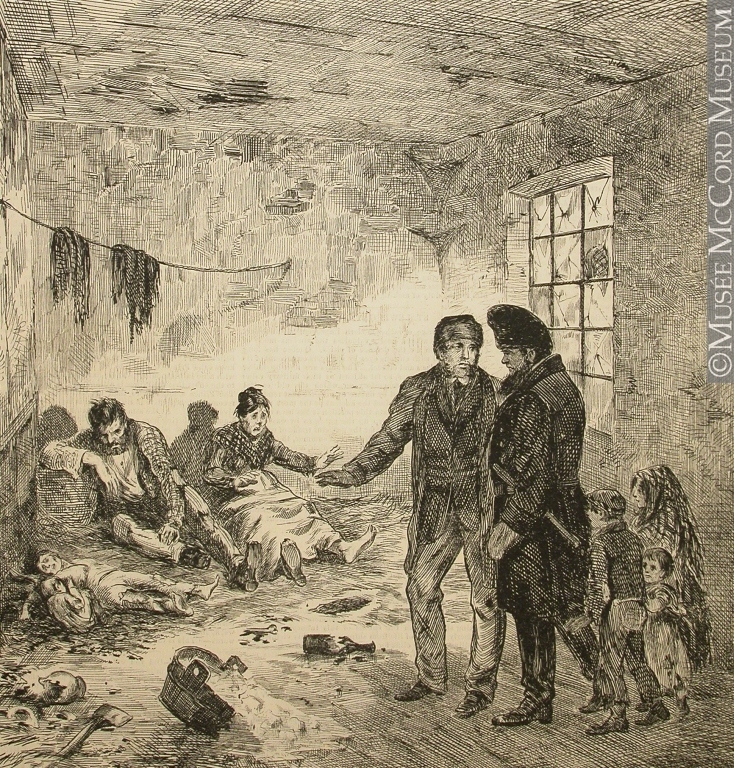 Most Canadians are familiar with famous cases of hypothermia such as the victims of the Franklin Expedition, the Scott Expedition, the Titanic (whose passengers technically succumbed to “cold shock” not hypothermia), or perhaps even the Saskatoon freezing deaths, but probably none of us personally knows of anyone who has frozen to death. There are several reasons for this. 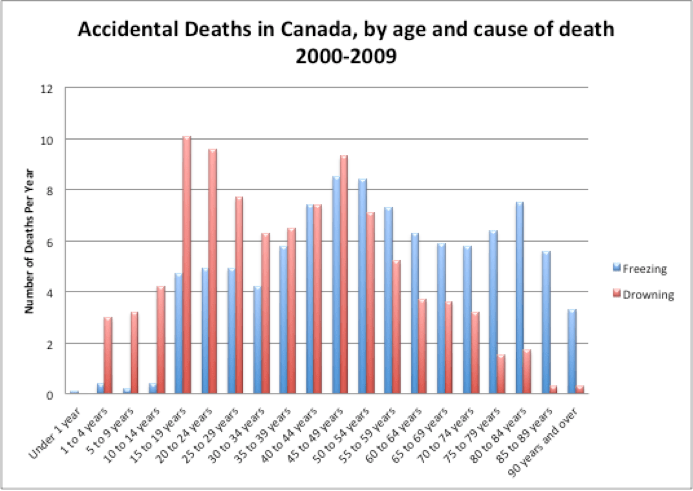 First, the Canadian Vital Statistics, Death Database shows that an exceedingly small proportion of Canadians die by “Exposure to Forces of Nature.” This is one reason why it seems so shocking to hear of someone who was lost in a blizzard or frozen to death, often within a stone’s throw of safety. Yet in northern climates it is still a very real concern. Of all the accidental deaths since 2000 the overwhelming majority (78 percent) died from “Exposure to Excessive Natural Cold.” Most freezing deaths are men, but some particularly disturbing recent cases have included abused women and children. However, roughly the same number of victims perish from the cold each year as those who die by drowning, and yet we are much more aware of deaths by drowning. (Oddly, drownings are not included in the “forces of nature” category.) Most of us are willing to risk a swim in the ocean, but not many try sleeping outside in January. The second reason you’ve probably never personally heard of someone who has died in this way is because of the demography of cold weather victims. A breakdown of the data shows that the largest group of drowning victims are teens and twenty-somethings, but victims of cold weather are older. Most are over the age of 50. And whereas drownings happen at the resorts and beaches of the middle class, cold weather deaths are probably more likely to occur in alleys, abandoned buildings, and other residences of the poor and homeless. It’s possible that some older residents were made of tougher mettle, but it’s more likely that they are less mobile and less able to “sleep over” at places like warming centres. For those without family the challenges can be threatening. One 76-year old Cancer patient opted to stay put in his freezing basement over the holidays, because his diagnosis (not to mention a fallen electrical wire in his driveway) made leaving riskier than staying. Still, this Austrian survivor of the Second World War claims it was only “the fourth or fifth worst Christmas of my life.” He had a small stove and his son brought some firewood from Waterloo, but still the basement hovered around 10 degrees. Where do you go for fuel? For all of their conveniences, we forget how much we rely on hydroelectricity and carbon supply chains (both biomass and fossil fuels) for staying warm and fed in the twenty-first century. Ice storms are a poignant reminder, and when they cause outages for more than a few hours, people start looking for things to burn. Most gas and oil furnaces are useless without electricity to power the burners and circulate the heat, and most new gas and even wood pellet fireplaces require electricity for the same. Homeowners with open hearths and solid-fuel burning stoves are in luck (apartment dwellers are not), but only if they have a supply of dry firewood and kindling at hand. People quickly discover that firewood is not a simple commodity. Burning furniture and fabrics is an expensive way to keep warm. They disappear in minutes and do not give off much heat. Firewood requires processing, and there is a surprising range of quality and price depending on whether it is hardwood or softwood, dry or “green,” blocked or split. People offering “free” firewood in the middle of an ice storm may seem like heroes, but if it consists of large, green, ice-covered trees and tree limbs like the wood in this picture it is more yard waste than fuel. 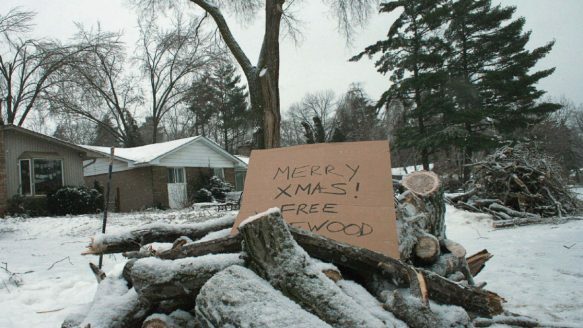 Others, like the Toronto-area businesses who advertised “Mennonite Firewood” in response to the ice storm (and every weather report since), show that the commodities – and the marketing techniques – of the nineteenth century energy chains live on 141 years later. Armand-Augustin-Louis Caulaincourt, With Napoleon in Russia translated by Jean Hanoteau (New York, Morrow 1935). Alpha, “Frozen to Death,” Canadian Illustrated News, January 27, 1872, p. 50. Robert Sweeny and Goupe de recherche sur l’histoire des milieux d’affaires de Montreal. Les Relations Ville/Campagne: Le Cas du Bois de Chauffage (Montreal: Montreal Business History Group, 1988), cv. Christopher R. Adams, “Impacts of Temperature Extremes,” Cooperative Institute for Research in the Atmosphere < http://sciencepolicy.colorado.edu/socasp/weather1/adams.html>, accessed 1 January, 2014; Edwin M. Kilbourne, “Heat Waves and Hot Environments” in Noji, Eric K., editor, The Public Health Consequences of Disasters, New York, Oxford University Press, 1997: 245-269, 270-286. Wake-Up Call: Why We Need Powerful New Emergency Protocols, CARP Canada, 10 January 2014. Karen Born, Verna Yiu & Joshua Tepper, Sheltering Canada’s Homeless, Healthy Debate, 30 January 2014. Josh MacFadyen, “Urban Energy & Ice Storms,” London Public Library, Western History talks, March 25, 7pm. This is a great (and timely) post. Your argument regarding continued dependence on fuelwood, even in urban environments, is an important one. Thanks Sean. I don’t usually do urban history, and I’m a little surprised that firewood brought me there, but that’s what I’ll be writing about for the Canadian Business and Environmental History workshop this year. Roughly 25,000 homes burned wood in Montreal as their primary heat source, right into the 1940s. That’s a lot of woodpiles for Canada’s Metropolis. I thought I’d set a link to David Zylberberg’s response to this article on his personal blog and the interesting conversation he started there. He makes some good points about the history of what we consider room temperature. Thanks, David. It made me re-think my own post. I wouldn’t want readers to think that replacing hydroelectric power with wood would be possible, or even desirable in this context. Biomass is sometimes considered a carbon-neutral fuel source, but transporting it to cities in solid form is pretty inefficient. Rather the larger project from which this piece is drawn argues that wood was part of a mixed urban energy system (and the only rural heat source) until quite recently in many parts of Canada. Perhaps the more important lesson from the ice storms is that we tend to forget how complex and fragile our energy supply chains are until moments like this, I argue that historical systems were even more complex. Thus as you’ve pointed out, people used less energy and valued it more.